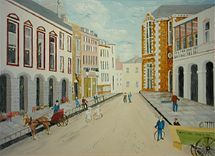 The amateur artist, Ted Rowe, has been inspired to paint the Market Place in St Peter Port, as many locally based artists such as Henry B Wimbush (exhibited 1881-1908) have done before him. Records of our towns and landscapes are becoming increasingly important, as the change to the environment around us becomes more rapid. Ted was born in 1926, and his knowledge and understanding of the Island over many years adds another dimension to this honest straightforward painting; it is an expression of a man's understanding of his home, as well as illustrating an artists natural desire to depict what is around him. From the beginning of Art History artists have always had a desire to depict their towns and cities. Great architecture conveyed the wealth, power and sophistication of a city or kingdom. There are examples of Roman wall paintings dating from the 1st Century AD, which illustrate how important the representation of architecture was to this great civilization. During the Italian Renaissance, the rebirth and discovery of Classical Greek and Roman art and architecture led many artists to depict contemporary 'Classically' inspired architecture through their art. It also enabled artists to illustrate the use of perspective, which had also been rediscovered during the early Renaissance. This interest in town and cityscapes continued throughout Art History, with artists such as Canaletto (1697-1768), who specialised in portraying cities such as Venice, as well as London. 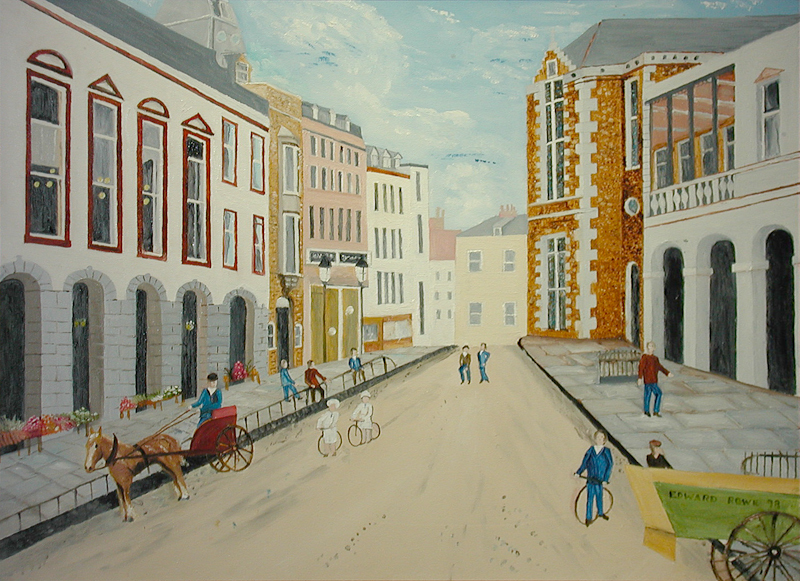 In the 19th Century townscapes were often painted by anonymous Naïve artists, who were perhaps commissioned by owners of property to paint and record their home or business premises. Today, professional and amateur artists alike, continue to depict the architecture and townscapes around them. We are drawn to capturing what is outside our front door, as well as being fascinated by past images of our towns and cities.